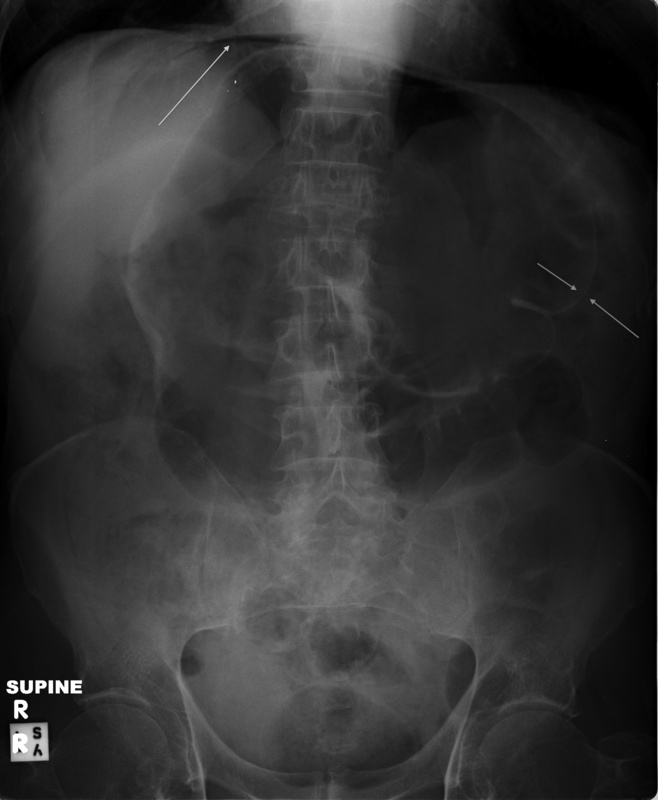 50yo man suffered a minor back injury 2wks earlier. He had been assessed in the emergency dept. No significant injury was detected so he was sent home with prescription for panadeine forte, instructions to take in addition to Nurofen (if required), & to avoid strenuous activities (especially heavy lifting). He re-presented to ED complaining of 2wks of constipation & decreased appetite. He denied vomiting & abdo pain, but mentioned vague chest discomfort. Clinically chest examination was unremarkable (including ECG). His abdomen was distended, especially superiorly, & was resonant to percussion. PR was unremarkable with moderately soft faeces. ED registrar ordered CXR & AXR. CXR clearly shows gas under the diaphragm. AXR supine view shows dilated transverse colon & free intraperitoneal gas. This is differentiated from intraluminal gas by Rigler’s sign (arrows) where both sides of the bowel wall are clearly visible (due to gas being on both sides). There are air-fluid levels on the erect AXR (arrows). 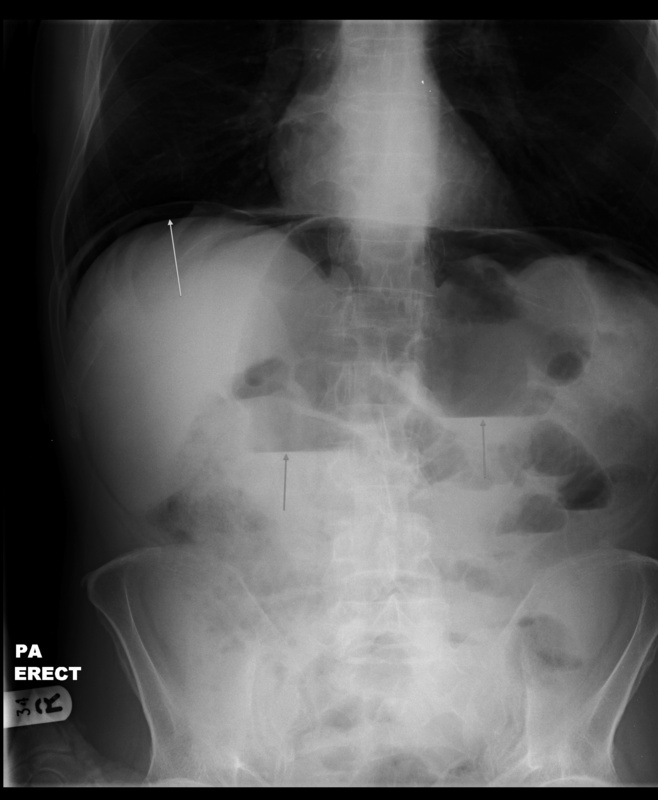 Patient had perforated gut. While it is unusual for a patient to have so few symptoms, careful clinical examination gave a hint. This is an absolute indication for surgical exploration. At OT there were multiple serosal tears, thought to be due to distension from ileus caused by codeine. Although the patient had been taking NSAIDs there weren’t any ulcers seen (another potential cause of perforated gut in this case). 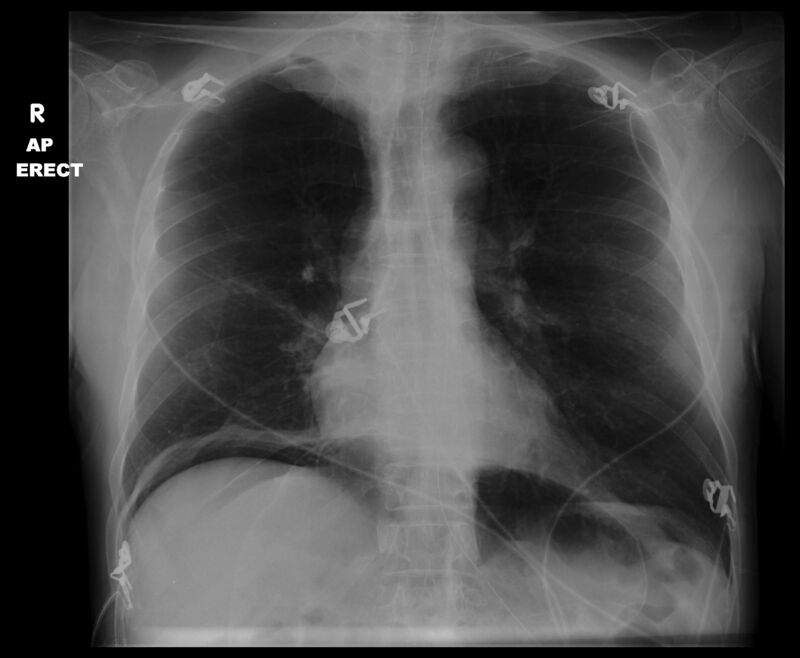 To find out more about radiographic findings in this condition – follow the links. These are from Radiopaedia.org – imaging FOAMed! As usual, our friends from Life in the Fast Lane have a page dedicated to free gas on AXR.